Born in New York City on November 20, 1919, Wright comes from a family of prominent African­ American physicians. In 1938 she won a four­ year scholarship to Smith College in Massachusetts, performing at the top of her class and setting records in varsity swimming. Upon graduating in 1942 she entered New York Medical College and received a medical degree with honors three years later. Wright was appointed visiting physician at Harlem Hospital in 1949 and later that year was promoted to clinician at the hospital’s Cancer Foundation. Conducting research in tumor response to chemotherapy (the use of chemical agents to treat disease) in cancer treatment, she investigated the complex nature of the disease as demonstrated in test animals, tissue samples, and patient responses to chemotherapy. She became director of the foundation in 1952. In 1955 Wright began supervising the chemotherapy research department and teaching research surgery at New York University’s Medical Center. Six years later she became adjunct professor of research surgery at the university and vice president of the African Research Foundation, subsequently touring East Africa as part of a medical team. Wright served on the 1964 President’s Commission on Heart Disease, Cancer, and Stroke, advocating the development of centers for the treatment of these diseases. The following year the Albert Einstein College of Medicine honored her with its Spirit of Achievement Award. New York Medical College appointed Wright to the positions of associate dean and professor of surgery in 1967. She also participated in the medical school’s administration. Wright earned numerous awards throughout the 1970s and 1980s, and in 1983 she presented a lecture entitled “Cancer Chemotherapy: Past, Present, and Future” at the convention of the National Medical Association. In 1987 Wright became professor emerita of surgery at New York Medical College. She has also served as a trustee of Smith College and the American Cancer Association and has been an editor of the Journal of the National Medical Association. Wright has promoted and conducted influential research in the field of cancer chemotherapy. Along with other members of her family, she has also been an inspiration and role model in the African­ American community. Wright carried on her family’s legacy in the medical field. Her father, Louis Tompkins Wright, was among the first black graduates of Harvard Medical College and was the first African ­American physician to join the staff of a New York City hospital. Her grandfather was among the first graduates of Tennessee’s Meharry Medical College, founded to train former slaves in medical fields. Harry D. West, another of Wright’s relatives, was the first president of that institution. Wright introduced several chemotherapeutic agents and techniques subsequently used to treat malignant tumors. Her chemotherapy research and educational efforts influenced progress in the field. Her work directly affected public health policy both on the national and regional levels. Wright’s report to the President’s Commission in 1964 led to the development of a nationwide network of cancer ­treatment centers. 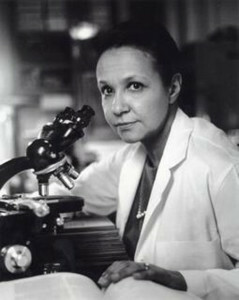 At New York Medical College, she contributed to the development of a program of study of cancer, heart disease, and stroke. Posted on March 10, 2015 by Natalie. This entry was posted in Physicians. Bookmark the permalink.